You’re not alone if you’re often wondering if your marketing team is doing all the “things” needed to grow your brand and business. The reality is — with the massive demands on marketing each day, it’s too easy to get stuck in “batch and blast mode” by focusing on the campaign de jour. This exclusive whitepaper will take you through our Demand Factory™ framework and the elements it takes to build and maintain one to ensure you’re running a high performance demand generation machine. 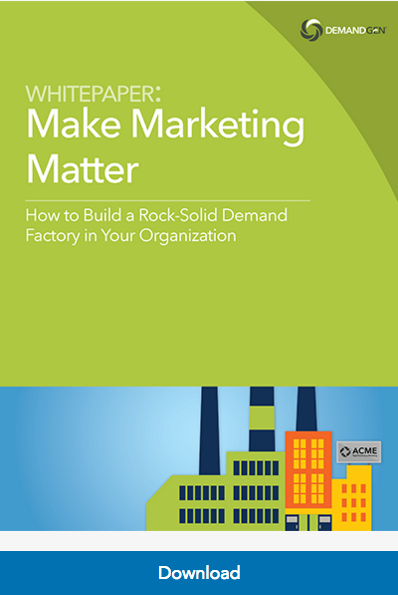 The concept of “Demand Factory” can be explained by metaphor: imagine an actual building supported by four pillars—A, C, M, and E.
Download our free whitepaper to learn more!